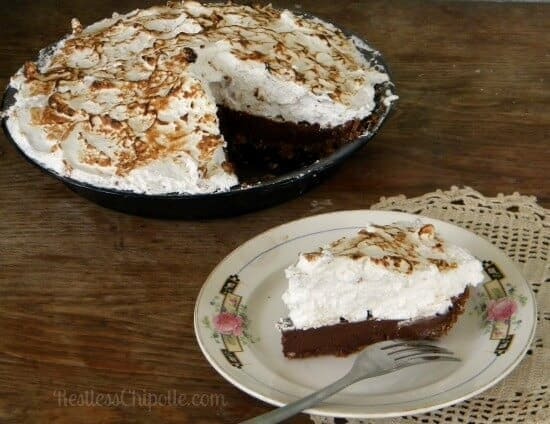 This easy no bake s’mores pie recipe has a thick, creamy, chocolate filling topped with a marshmallow-y meringue that’s browned with a torch for the perfect toasted marshmallow texture and flavor. You’ll love this pie! 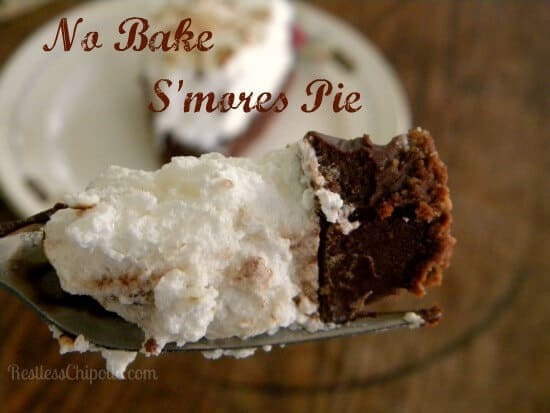 When I saw this No Bake S’mores pie recipe it immediately whisked me back to the late 1960s and the weekend camping trips that were a major part of my life at that time. Camping was something that we did a lot when I was a kid. Living just outside of Philadelphia in the 1960s meant that there were lots of wooded areas and campgrounds close by. I don’t know how it is now, but in 1967 Pennsylvania was still full of wilderness areas. My parents had an old Airstream trailer and Mom would get it packed up on Friday so we could leave for parts unknown as soon as Dad got home from work. We’d camp somewhere different every weekend, often taking my very best friend, Chris (who is now an impressively famous artist). We’d hunt for all kinds of things in the woods, fish, run around – but mostly we’d enjoy that freedom you get when you are a kid and you are camping. I liked my marshmallows just golden, and I am sure he will correct me but I think he liked his burnt. Or, maybe he just said he did because he didn’t toast them as well as I did. We’d camp until the chilly Pennsylvania autumn forced us to stop… and I always looked forward to the next time. I have probably mentioned this a hundred times before but… for really good meringues you have to add the sugar very slowly. Start with a clean bowl and whisk attachment, rinse both of them well with vinegar and use room temperature egg whites. Start adding the sugar when the egg whites are frothy and look like frosted glass. August holds the hottest days of the year and it is really easy to just forget about dessert. This no bake s’mores pie will totally change your mind. You can make it a few days ahead of time but don’t do the meringue until right before serving. Take THIS to your next potluck and see what happens. An easy no bake pie that is sure to be a show stopper at any picnic or party. 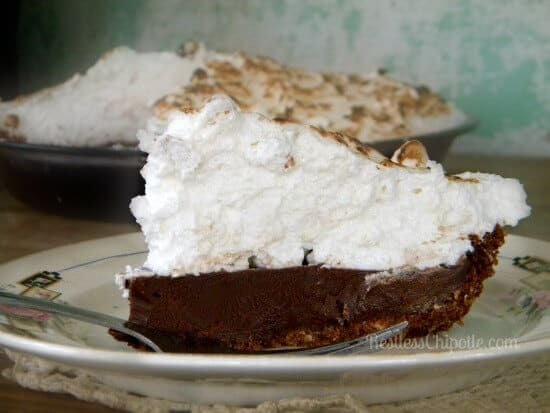 A chocolate graham cracker crust, ganache filling, and vanilla meringue topping will take you back to those gooey campfire s'mores - without the mosquitoes. 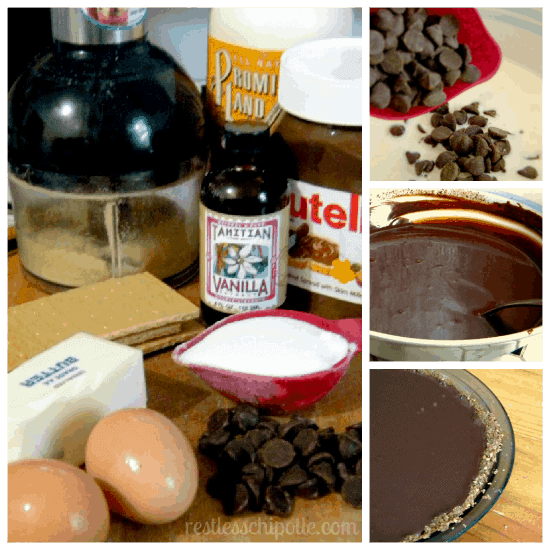 Mix graham cracker crumbs and remaining ingredients until well blended. Mixture will be a little crumbly. 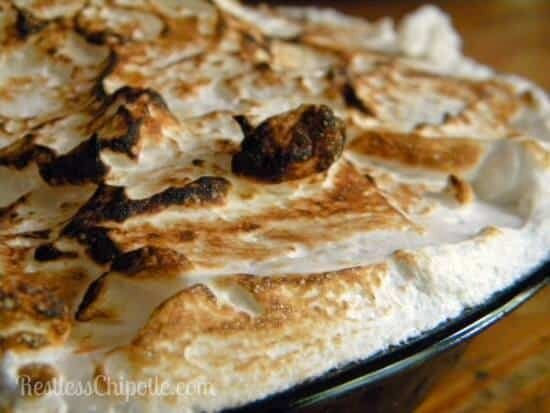 You can serve the pie without browning the meringue if you want but it is more marshmallow-y when it is browned. This pie is perfect for summer! Thanks! Yep… it goes fast! Excellent meringue tips! I didn’t know! 🙂 thanks! Meringue is tricky stuff! OMG that fluffy toasted top is everything!! 🙂 this was an amazing pie! How lucky to have such wonderful memories! This pie is beautiful too! I learned so much about meringue, Marye. Thank you. I didn’t know adding the sugar gradually was so important. Got this great recipe filed away. Good for you with the plumber’s torch, I can see you with it! Woo hoo. I need to get me one too. Look at all that whipped cream! We’ve been making s’mores with our backyard firepit but only in the summer. I like that I can make this pie year round and get that true summer flavor! Sounds wonderful, maybe it’s just me but the pictures aren’t showing up for me. I have to click on the tiny little itty bitty grey box for it to pop up in a new window. I hope everything is okay! never mind now your pics are coming up! looks scrumptious! Glad it was resolved. It’s been ok for me. Maybe a quick glitch? Your childhood sounds magical. I swooooooon every time I see an Airstream. Don’t ya just love the beauty in how a recipe can bring back so many good memories? And that pie looks deeeelish. It wasnt perfect but in a lot of ways it really was magical. 🙂 I’d love to redo an old airstream on my property to turn into my office space! What great memories! We try to go camping with our kids during the summer, but don’t go as often as we would like to. I haven’t been in years but it’s a great way to build memories! Oh my! This pie looks so so good. I camped a lot in Pennsylvania as a child too. It’s still one of my most favorite things to do.